Alföld Department, Békéscsaba, Hungary 7th-8th November, 2013. Post-socialist societies were and still are hit particularly by the recent crisis that reinforced trends toward socio-spatial polarization and dependence. It is our aim to bring scholars from various fields and disciplines together and discuss how recent changes (re)produced inequalities, how East Central Europe was re-positioned in European and in global flows, and how such processes were responded by various agents. 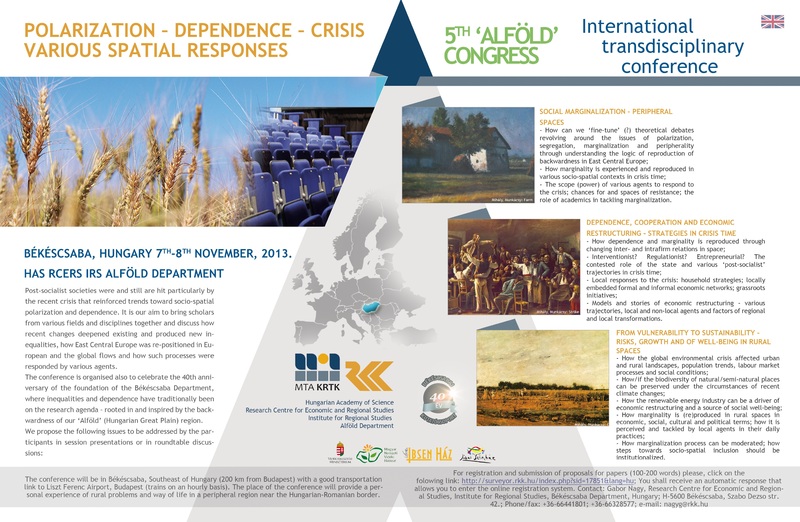 The conference is organised also to celebrate the 40th anniversary of the foundation of the Békéscsaba Department, where inequalities and dependence have traditionally been on the research agenda – rooted in and inspired by the economic backwardness of our ‘Alföld’ (Hungarian Great Plain) region. The scope (power) of various agents to respond to the crisis; chances for and spaces of resistance; the role of academics in tackling marginalization. Models and stories of economic restructuring – various trajectories, local and non-local agents and factors of regional and local transformations. How marginalization process in rural spaces can be moderated; how steps towards socio-spatial inclusion should be institutionalized. The conference will be in Békéscsaba, Southeast of Hungary (200 km from Budapest) with a good transportation link to Liszt Ferenc Airport, Budapest (trains on an hourly basis). The place of the conference will provide a personal experience of rural problems and way of life in a peripheral region near the Hungarian-Romanian border. You shall receive an automatic response that allows you to enter the online registration system.